How much is a 4-pound truffle worth? 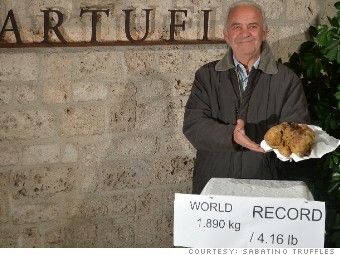 The largest white truffle in the world sold at auction this weekend for just $61,250. The truffle, which was discovered last week in Italy by Sabatino Truffles, weighs in at a record 4.16 pounds and was sold at Sotheby's in New York on Saturday. Immediately after the find, the truffle company received a $1 million offer from a buyer in China, but decided to put the delicacy up for bid instead. 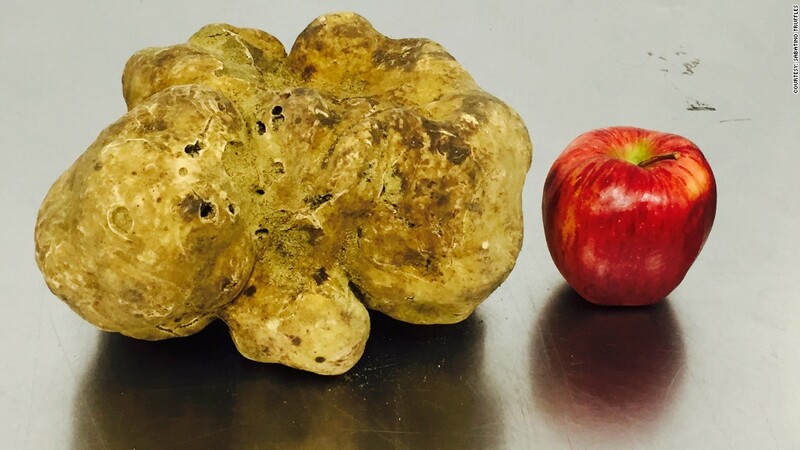 This white truffle is twice the size of the existing record holder that sold for $417,200 in 2010, according to the auction house. "This is an extraordinary find," said Federico Balestra, president of Sabatino Truffles. White truffles are rare and can only be found in select areas of Italy during three months of the year. One of the company's truffle hunters found the treasure while out with a young dog. "Usually it's the older, more experienced dogs that make these finds because it takes a very trained nose to find them," Balestra explained. "White truffles can be buried 10-15 inches underground sometimes." But this food gem was discover only about four inches down. "When the hunter started to dig, he realized how much he had to keep digging and the size of the hole he was making. He couldn't believe it." The proceeds of the sale will go to New York City's Citymeals-on-Wheels and the Children's Glaucoma Foundation in Boston.